I don't know if this is a bug or not, because a friend told me that rings shouldn't have the option to be socketed. Slayer's doesn't have the option to socket but apparently orange ones does. Is this a bug or not? Also if this isn't a bug, I want to ask what kind of gems are possible to be socketed into these. This was recently added in the latest patch. "However, Necklaces, Rings, and Off-Hand items level 101 or higher can now have sockets..."
"...level 101 or higher now have sockets..." that's clear. The screenie shows a lv93 item however. 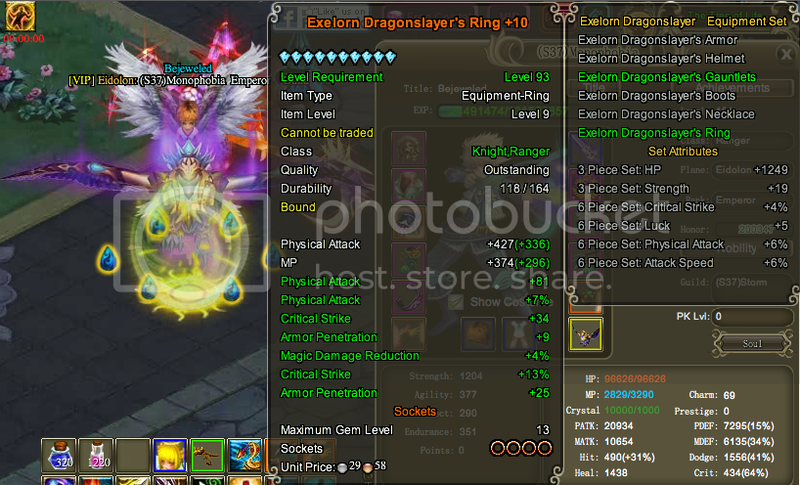 Would like to add too that the above ring, lvl 93 has just been socketed with an attackspeed gem. So these gears can be socketed as well, not only level 101 items or what? Last edited by oceangreen; 12-14-2012, 04:04 AM. Yes, this level 101 thing is confusing! So I shall kill you..
My level 80 offhand has gems in it. After a little bit of synthing, the lowest epic shard ring that can be socketed is the exelorn set, which is in the 90s.